Gonchar was a lethal weapon on the power play and also played sound defense. In this article, NoVa Caps looks back at Gonchar’s time in Washington and examines his Hall of Fame credentials. 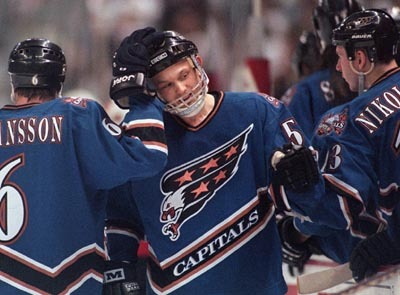 Drafted by the Capitals 14th overall in the 1992 NHL Entry Draft, Gonchar had seven points in his first season (31 games played) and showed huge potential. He broke out as a top-notch offensive defenseman in his second season, where he recorded 41 points (15 goals, 26 assists) in 78 games played. He followed that up with several seasons of high offensive production, including six straight seasons of 30 or more points (1998-2004). 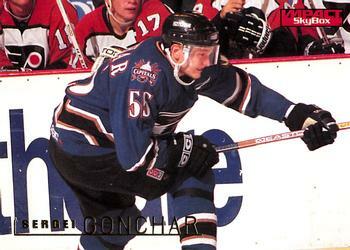 Gonchar remained a productive defenseman for the Capitals through the early 2000’s despite the team’s struggles. As part of their rebuild, the Caps dealt No. 55 to the Boston Bruins in exchange for defenseman Shaone Morrissonn (who would play with the Capitals for five seasons) and two draft picks (one of which that turned into first-rounder Jeff Schultz, who, ironically, would also wear No. 55). Gonchar would finish the season with 58 points, which led all NHL defensemen. 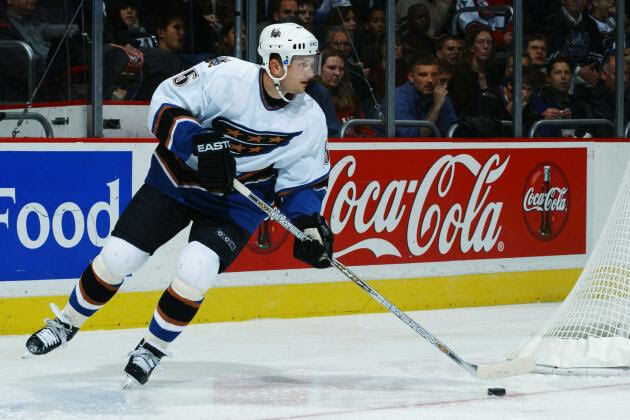 Between 2000 and 2004, Gonchar recorded more points than any other NHL blueliner with 241. The Russian rearguard ranks fourth in all-time points by a Capitals’ defenseman, fourth in games played, second in goals (five behind leader Kevin Hatcher), and fourth in assists. Gonchar then spent five seasons with the Pittsburgh Penguins, three with the Ottawa Senators, two with the Dallas Stars, and half a season with the Montreal Canadiens. Retiring in October 2015, Gonchar finished his career with 811 points (416 as a Capital) in 1,301 games played, good enough for 16th in NHL history. Despite his immense talent, Gonchar never won a Norris Trophy as the NHL’s best defenseman; the closest he ever got was finishing fourth in voting three times. Even still, Gonchar has made a legitimate case for the Hockey Hall of Fame and though he may not be a first-ballot inductee, he is more than deserving of induction. He won a Stanley Cup with Pittsburgh in 2009 and finished in the Top 10 in Norris voting nine times. Clearly one of the best offensive defenseman the league has seen in the last 20 years, Gonchar’s place in Caps lore is unquestioned as he was a key contributor in his ten years in DC, especially to the team that advanced to the 1998 Stanley Cup Final (Gonchar had 11 points in 21 games). What do you think Caps fans? Is Gonchar worthy of being inducted into the Hall of Fame? This entry was posted in History, News, Players and tagged Michael Fleetwood, Sergei Gonchar. Bookmark the permalink.